World Candidates 2014-13: It’s a rematch! With a tough draw against Sergey Karjakin today, Viswanathan Anand has earned the right to challenge Magnus Carlsen to a return match for the World Championship in November. With one round remaining Anand sits on and undefeated +3 while there are no other scores above 50%. 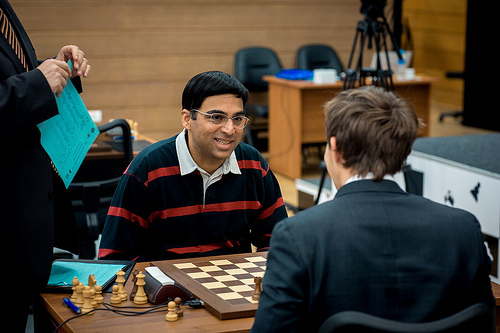 An obviously pleased Anand is exchanging pleasantries after clinching a spot to face Carlsen. Photos by FIDE.com. Dmitri Andreikin continued to put his stamp on a good tournament by beating Levon Aronian and Vladimir Kramnik beat his nemesis Veselin Topalov after an exchange of blunders. The two still aren’t shaking hands regularly since the “toiletgate” match in 2006. With a draw Peter Svidler has climbed out of last place and faces Anand tomorrow in what will probably be a ceremonial draw. Anand will be underdog to Carlsen, clearly. But chess history has shown rematches have their own dynamics. Rarely a repeat of first. So much for Anand fading away, content with being a former champion. Congratulations to Vishy! The first match was “Kid chasing the Tiger”, the rematch will be the “Tiger chasing the Kid”. I think I would rather be Anand due to the anticipation factor. I wonder if Carlsen can handle the anxiety. It will be a different match when you’re being chased by a tiger.